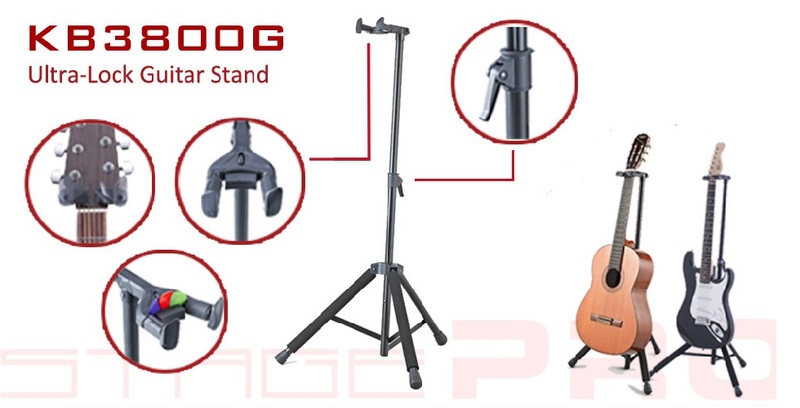 The StagePRO Series KB3800G Ultra-Lock Guitar Stands is the first auto-locking guitar stand with a width-adjustable neck cradle. This feature allows the user to adjust the support arms to fit their particular fret board and headstock. The Ultra-Lock is a neck-suspending stand, which was originally invented by Hamilton over 30 years ago and has been copied by many. The unique width adjustment of the neck cradle is made with a serrated roller on top of the mechanism, for easy changes as different instruments are used on the stand. The locking security gates activate when an instrument is placed in the stand. The design allows custom fitting to a wide range of fretted instruments - from banjo to classical or 5-string bass to "skinny-necked" electric. Additionally the adjustable support mechanism folds back for more compact storage and travel than other popular auto-locking stands. And the fret board/headstock cushions include slots for pick storage. The stand structure is large diameter tubing. Secure height adjustment is made with an over-center camoperated lock. The neck cradle and front legs have satin-feel cushions. Finished with a durable black powder coating, the stand comes in an attractive, retail-friendly self-merchandising box.